Happy Monday everybody! I’m out doing my Lightroom seminar tour this year (I’ll be in Chicago and the Detroit area with my seminar next Monday and Tuesday respectively), and I get lots of questions about the tethering rig I use, so I thought I’d share a few Behind-the-Scenes shots from a studio shoot I did a few weeks ago (shots for an upcoming book), where I can break down the set-up (and the lighting while we’re there, right?). You can’t see it in this photo, but it’s super awesome is their optional Aero Cup Holder accessory, which slides under the Aero Table and you slide-it-out when you need it. It can hold a water bottle, coffee cup, but it’s also awesome for holding your phone during the shoot, or extra batteries, or whatever you need handy during the shoot. It’s $29.95. Totally worth it. The folks at Tethertools are putting together an entire kit of all the stuff I use, and doing a bundle deal for all of it. I don’t have all the specifics, but one day, it will be available, somewhere, somehow. How’s that for specific info? ;-) BTW: When it does come out, I don’t get a commission or kickback (sadly), it’s just for the convenience of folks who come to my seminar and want the same rig. I’ll share the details here on the blog when it’s available. Since we brought all this up, we have to take a quick look at the lighting, right? It’s simple Clamshell lighting with both lights directly in front of our subject. The top light is an Elinchrom 17″ beauty dish (no diffuser — you can get away without using a diffuser if your subject has really clear skin), and the bottom light is a 24″ square Elinchrom Rotalux softbox. Both strobes are Elinchrom ELC 500-watt strobes, and I’m triggering them with a Skyport Transmitter sitting in my camera’s hot shoe. Pop Quiz: what happens one week from today? I’m in Chicago with my brand new Lightroom OnTour full-day seminar. Guess what happens the next day? That’s right — I’m in the Detroit area (Livonia, Michigan to be exact) with the same seminar. Two days. Two seminars. What could go wrong? ;-) – Hope you can come out and spend the day with me (you can still grab a ticket right here). Every Friday is Photo Tip Friday! Well, at least it is on the KelbyOne Facebook page, where each Friday, we post a quick photography, Lightroom or Photoshop tip (either from me, or one from some of our awesome instructors), and they’re all just 1-minute each (or less). Well, at least thats’s the goal. 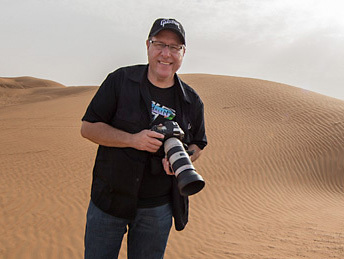 If you missed any from the previous few Fridays, you can check ’em out on the KelbyOne YouTube page (ya know, you should subscribe to our YouTube page). I’ve spent the past few days out in Oregon taping some classes on Essential Techniques for Landscape photographers, and Essential Post-Processing techniques for Landscape photographers, and we just wrapped up today, and then we drove to Portland last night for my seminar here today (hope I’ll get to meet you in person here today). Yesterday Brad posted about my new class on simple Fashion lighting, but we didn’t have the class trailer. Now we do, and it’s right there above (it’s just a minute, so I hope you’ll check it out). OK, that’s it from here in chilly Portland. Hope you all have a great weekend! P.S. Did you see the awesome team of instructors we have lined up for the Lightroom training tracks at the Photoshop World 2016 conference this summer in Vegas? Check ’em out below. If you follow me on Twitter or Facebook, you probably saw a post or two of mine looking for a cool car to shoot after my seminar in Phoenix. Well I found one. Actually, two. Last year, I got to shoot a classic Cobra and a brand new Corvette at photographer Paul Markow’s studio in Phoenix (a super-nice guy with a killer studio — big enough to shoot a car no problem, and a cove roof to bounce the lights off). This year I wound up shooting a Maserati GranTurismo — seen above (believe it or not, I rented it from Enterprise rent-a-car in Phoenix for a song), and then Adam Thaler, a photographer who follows me on Facebook, saw my search for an exotic car and brought over a red Ferrari California — so the shoot was on! If you’ve been following me on Facebook, Twitter or Instagram, you’ve probably seen me posting some shots from a class I’ve been working on about my location lighting set-up. I had four different location shoots planned for the class (we wrapped up taping last week), but the day before Photoshop World we did the first shoot out on a dry lake bed just outside Vegas. The softbox was my go-to softbox (been using this for years); it’s my Elinchrom Rotalux 53″ Midi Octa. I just love that softbox (and it’s not too crazy expensive for being fairly big — it’s $329 at B&H Photo). I knew I’d already be there; my video crew would already be there for Photoshop World starting the next day; and Kalebra would be there with me to do the Art Direction (she rocks! ), so I thought this would be a perfect opportunity to pull off a shoot like this. Ya know, except for the whole shooting in the desert in the August heat thing. One thing that made it a bit complex is that we were kinda out in the middle of nowhere. We were going to need a restroom on the scene, and a place for the model to get hair/makeup and to change outfits. We had a large crew: our video crew and producer (this is part of a KelbyOne class), Brad, my assistant Lynn and a second photo assistant. We had a location scout, and Kalebra and I working on the direction and shooting, so we wound up renting this production trailer, which is what they would normally use on a movie or TV production, but it worked out really well (as long as we didn’t run all four air conditioners, which would blow a fuse). Check out the video below for more on the production trailer. Above: Here’s a little iPhone BTS video we shot so you could see the set-up, and we went in the production trailer for a quick tour, too. It’s pretty short. Worth checking out. Brad’s throwing a little light back with a reflector. Touching up the makeup between shots. It was hot. Above: Here’s a gallery of some behind the scenes shots. Click to see a larger version. I really was able to cover a lot of stuff — four different shoots and an entire section just about the gear to start it all off. I’ll let you know as soon as it’s ready. Above: Here’s some thumbnails from some of the other finals from that shoot. More to share in the class. Shooting a Wedding? Don’t Forget an iPad to Take Pictures of The Rings. Or…. When I mentioned on Facebook I was shooting a wedding on Saturday, Jose Rodriguez (who follows me on FB and who had been to my original “Shoot like a Pro” seminar) wrote, “Don’t forget an iPad to take pictures of the rings” which brought a flurry of follow-up questions from photographers asking why. Here’s why â” it makes a great surface to create reflections of the rings if a glossy black piano (my first choice) isn’t available. This is a trick I shared in my original Shoot Like a Pro seminar, and it was my wife Kalebra who came up with the idea when we were doing a shoot last year at the reception hall and couldn’t find a black piano. Above: That’s me shooting a 100mm Macro using natural light to light the rings. By the way â” the iPad mini (shown here) is turned off to give a solid black background. Above: here’s the rings from Saturday – I love the design of the groom’s ring. Above: The wireless trigger is still on there from shooting earlier – this was just window light. â¦classic shot where you lay the ring flat between the pages of a open bible and then fire a flash behind it at an angle so it makes heart shape shadowâ¦ wellâ¦yesâ¦yes I did! (and the bride absolutely loved it!). She liked it so much, in fact, I was tempted to do a selective color effect (but I restrained myself). â¦in case you don’t follow me on Facebook or missed it there (the two posts really struck a chord with folks, getting 7,200 likes (that’s a LOT for my Facebook page), and 358 comments. I read every single comment, but what’s been really cool is how many people who literally tried the technique this weekend on their Wedding shoots, or they just tried it with their wedding rings now and posted examples. Some really great stuff, including my favorite taken outdoors, under a tree, on the hood of a Camaro by photographer Laura Beth Robinson. Lots of really great shots!